The measurement of anti-CCP antibodies has become the method of choice in the accurate diagnosis of Rheumatoid Arthritis. 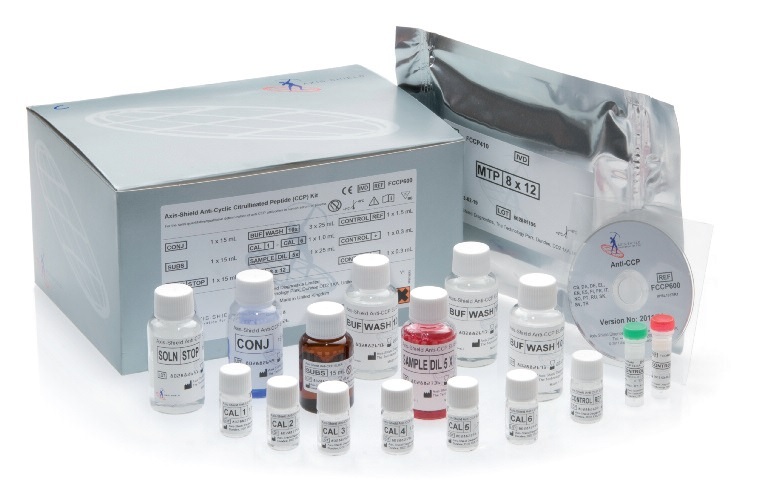 Assays using the second-generation CCP2 peptide are as sensitive as the rheumatoid factor (RF) test but with much higher specificity. Additionally anti-CCP2 positivity can predict future development of RA in both asymptomatic individuals and in patients with undifferentiated arthritis. It has also been shown that antibody levels at presentation can correlate with progression to erosive disease. A short video describing the benefits of Anti-CCP testing can be viewed here. The Axis-Shield Anti-CCP test is a semi-quantitative/qualitative enzyme-linked immunosorbent assay (ELISA) for the detection of the IgG class of autoantibodies specific to cyclic citrullinated peptide (CCP) in human serum (including Serum Separator Tubes) or plasma (EDTA, lithium heparin, or sodium citrate). Detection of anti-CCP antibodies is used as an aid in the diagnosis of Rheumatoid Arthritis (RA), and should be used in conjunction with other clinical information. Autoantibody levels represent one parameter in a multi-criterion diagnostic process, encompassing both clinical and laboratory-based assessments. The wells of the microtitre strips are coated with a highly purified synthetic cyclic citrullinated peptide containing modified arginine residues. During the first incubation, specific autoantibodies in diluted serum or plasma bind to the antigen-coated surface. The wells are then washed to remove unbound components. In the second incubation the Conjugate, an enzyme-labelled polyclonal antibody to human IgG, binds any surface-bound autoantibodies. After further washing, specific autoantibodies are traced by incubation with the Substrate. Addition of Stop Solution terminates the reaction, resulting in a coloured end-product and the amount of Conjugate bound is measured in absorbance units. In the qualitative protocol, the amount of Conjugate bound by the sample is compared with that bound by the Reference Control. In the semi-quantitative protocol, the concentration of anti-CCP autoantibody can be estimated by interpolation from a dose-response curve based on Calibrators. Our Anti-CCP technology is also used on Abbott ARCHITECT and Siemens CENTAUR systems. *Products may not be approved for sale in all countries. Please contact us for further details.